A group in a homestead including a woman and girls, looking towards the camera. A youth wearing a chain and perforated coin neck ornament looks on from the left. The film number suggests an Eastern Jikany homestead in 1935, possibly at Mancom where Evans-Pritchard spent some 4 weeks. Note on print reverse ms pencil - "83 3" & print front border ms ink - "NUER X/68"
Morton, Chris. 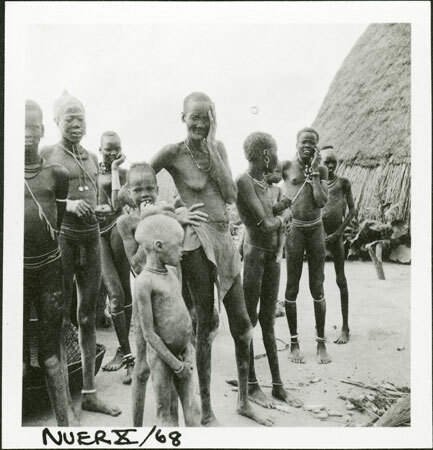 "Nuer woman and girls" Southern Sudan Project (in development). 03 Jan. 2006. Pitt Rivers Museum. <http://southernsudan.prm.ox.ac.uk/details/1998.355.482.2/>.